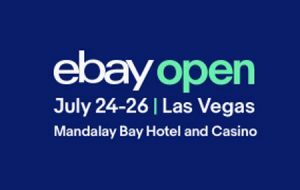 “Modernizing the eBay Platform” was the underlying theme of eBay Open, where 325 eBay employees were on hand staffing the event. Managers presented information to attendees about the beta payments test it will kick off in September, and if you’re considering participating, there are some important things you should know that came out of the eBay Open session – read more on this EcommerceBytes Blog post. While in previous years viewers at home were treated to live webcasts of sessions where eBay managers and techies described the changes being made to the platform, eBay only live-streamed speeches from CEO Devin Wenig, Senior Vice President Scott Cutler, and the Shine Awards ceremony. It planned to publish videos of workshops in the weeks following the event – presumably eBay wanted time to edit the video presentations. On the first day of the event, eBay announced a deal with Square Capital to offer financing to sellers. Such services have been available to sellers for years, such as Kabbage, which became available to eBay and multi-channel sellers in 2010, and from PayPal, which launched PayPal Working Capital in 2013, when it was still owned by eBay. eBay also announced a deal to accept Apple Pay. During his keynote address, Devin Wenig said he wants choice for buyers and simplicity and lower costs for sellers. He said PayPal will still be an option, but he said it shouldn’t be the only option. Of course, that’s what sellers have been telling eBay since 2005 when it rolled out its policy restricting sellers’ use of payment methods beyond PayPal and when it restricted paper payments (cash and checks) in 2009. Don’t expect a sudden influx of Apple Pay payments, however – as we reported, eBay is opening up its beta payments program in September to a small percentage of sellers. Per its 2015 breakup agreement with PayPal, it must transition to taking over as its own payments intermediary in stages. What Wenig didn’t say but was revealed to eBay Open attendees: eBay will ban PayPal from the beta testing – see this blog post for more information and seller reaction. During his keynote, which we covered in this Newsflash article, the CEO was asked what eBay was doing to attract new buyers and retain them. His goal: increase eBay’s buyer base from 175 million to “half a billion” buyers. To get there, eBay has to do the following, he said: modernize the platform; get better at customer service; and get quality sellers and inventory on to the platform. eBay Senior Vice President of eBay Marketplaces for the Americas Scott Cutler also spoke about modernizing the eBay platform during his keynote address. “We must have a modern marketplace that meets modern expectations, and we have to do this together,” Cutler told attendees. While that sounds like a worthy goal, it may strike fear in the hearts of sellers: glitches often result from changes, and buyer-friendly policies can be costly to sellers. As sellers were gathering in Las Vegas to attend the conference, eBay issued an apology for its latest glitch, admitting it had irretrievably lost some sellers’ photos, and Devin Wenig addressed the issue in his presentation. eBay executives didn’t address the third and final seller update for 2018, which came 2 weeks after eBay Open, on August 7th – you can read more about the Fall Seller Update here. Previous Previous post: Is It Time to Try Google Advertising? I am really curious to know exactly what he considers quality inventory? What exactly does he think ebay should be known as the place to go for? 1/2 billion people buying and returning purchased items, will cause both seller and ebay to go bankrupt. Ebay never does due diligence, on its buyers. Ebay hammers sellers instead. Accelerated business at a time of massive layoffs at ebay is a mangement huge mistake! Mangement of ebay is very swiftly moving ebay into a crisis mode…. Ebay is a failed experiment best watched from a distance. A whole 2000 people attended and 90 percent of them were first time sellers. They just proved they can entice anyone with or without a brain to list. Bet those 60 per cent newbies won’t be around for long. First of all I’m finding it hard to believe that people are actually getting loans to buy stuff on ebay – that’s like going to crazy town on someone else’s dime. So now your in debt for merchandise that ebay hides or your competing with chinese sellers who start everything at a penny? Then the loan shark who lent you the money comes looking for you??? Seriously – I used to help all my friends – teaching them to sell on eBay. I stopped doing that a long time ago. I currently have 1/2 million viable items in my warehouse and can barely squeak out 1 sale per day. Things are definitely different now. They weren’t exactly “open” about no paypal in the beta test. I learned a long time ago that greatness is built on two pillars…sincerity and generosity. Try applying those to ebay…AND it’s so-called leaders. I had no sales in July. now I know why. no Paypal?? I am a small seller – why only new sellers and big-time sellers at the meeting?? aren’t most sellers small to average in sales?? If Ebay keeps trying to be a “Better Amazon” it will fail. Ebay is NOT Amazon – two completely different animals. Small sellers – say collectibles or like me – quality used women’s clothing – can not offer 2-day shipping or pay for returns like Amazon who sells millions of the same items at discount shipping. I have 1500 items to try to sell, but I hate sitting here working for free. I pay for store for nothing almost anymore. I’ve been working at this 3 years now by the way to supplement my SS or try!